Generations ago, when Grathis, the God of Knowledge and Change and Magic, walked Tal’Vorn, his bizarre form writhing with mutation as he body shifted and altered with every passing moment, his immense power to alter reality causing the ground to shift under his feet. It was Grathis who first cast spells on Tal’Vorn, the other Gods following after him. It was Grathis who allowed Tal’Vorn to hold life for the 12 Elder Races. It was Grathis who constructed the Mani. Knowing that he would not always be there to provide a source for magic, Grathis placed a small portion of his energy loose in the atmosphere and gave it instinct. By responding to certain thought patterns, Mani would react and cause the effects that the 12 Races called Magic. Though this kills the Mani, it also causes the Mani to divide. Naturally, a newly divided Mani cannot read the thoughts of others instantly, meaning that the amount of magic that can be cast in one area at one time is limited. However, the mass creation of the Mani had many side effects. It stained the moon, Killar, blood red, caused the Vorn Glass Wastes, gave rise to many strange animals and, most brutally and unexpectedly of all, created the Beasts. Monsters without any real form, the first Beasts, created from living things that mutated under the effects of the magic, were essentially mindless, mewling magic born spawn that died within moments. Yet as time passed more stable mutants begin to appear, strange forms, combined goats and wolves, cow and bear, yet all standing and moving on their hind legs like any of the other Races. These Beasts had the heads of goats or horned cows and the strength of bears, physically larger then humans with a bestial cunning that belied there savage appearance. They hate the other Races because they are not cursed as the Beasts are; they are not altered from their natural forms as the Beasts are. Living in roaming war bands, the Beasts prefer the deep forests, safe from the prying eyes of other races. Yet this is not because they are full of fear, or nervous of the other Races. It is because they are not stupid. Beasts live by raiding, buy attacking caravans and portal communities, villages and isolated homes, killing anyone in the area, stealing anything they can easily carry and vanishing back into the woods again. They take the flesh of those they kill so that they can cook or devour the meat raw, baying out their blood-lust to the stars and moon. Beasts worship their own dark pantheon of gods, having no understanding of the True Gods of Tal’Vorn, preferring to place their trust in deities mixed with the darkest of emotions, gods of hatred, darkness, lust and terror. Though they do not know it, the Beasts are indirectly simply worshipping the Gods Killar and the Corrupter. Killar admires the Beasts for the carnage they cause, the devastation that is left in their wake, and the Dark God, the Corrupter, sees in the Beasts what they truly are. Abominations, mutants, horrific merging that mock the forms of the other Races. It is said that no one Beast is identical to another, that they are all unique and singular in their creation and mutation. Yet they do share some basic similarities. All have the legs of a goat or a cow, cloven hooves, heavy limbs, shaggy, hairy bodies and long curving horns. Indeed, it is the horns that show how powerful a Beast is, for they grow longer as they age, curving round into ever more elaborate shapes. Moreover, the only way for a Beast to grow old is to survive and the only way to survive is to be strong enough to survive. Thus strength and horn length are inescapably interlinked within the Beast tribal structure. Yet physical strength alone would not serve the Beasts. They would be cut down by those who control the Mani before they could bring their crude weapons to bear. Therefore, Beasts have their own magic users, their own Shamans. These Shamans control the flow of magic instinctively and are born with the knowledge that they need to cast their spells and control the Mani. They hold a high place in the society of the Beasts, feared and respected in equal measure, for the Beasts believe that those who kill a Shaman are cursed by the Gods and will in time be struck down for their crime. Naturally, these Shamans do nothing to alter their point of view, knowing that with fear comes respect and with respect comes power. 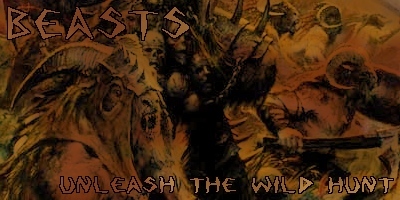 Indeed, it is rare for the Beasts to actually attack or move camp without consulting the Shaman, though it seems that some of the stronger willed Beastlords, the most powerful Beasts, do not always lead their tribes as the Shaman’s advice. The Beastlords are, as previously stated, the most powerful of all the Beasts, the leaders of their tribes and their elite fighters. They are possessed with the strength of a beast and the feral cunning of a man, their combat skills honed by their desire to survive and kill their opponents on the battlefield. By nature, most Beasts are tribal and will fight other Beast herds for the best raiding grounds, slaughtering each other to get the best areas to live in. Yet Beast tribes can also be united under a powerful enough Beastlord and for this, the Beastlord needs to call a group of herds to one place. The only places that the Beast herds can gather are Waymarkers. These stones mark junctions in the flow of Mani through the atmosphere and are thus holy sites to the Beasts. The Mani gather here in great numbers and the Beast herds can sense their presence. The Beasts will not spill each other’s blood within sight of the Waymarker and thus it is the only safe place for a Beastlord to call together the scattered herds. When the Beastlord arrives, he climbs atop the Waymarker and sounds the immense horns that are placed atop these stones. The shivering blasts that echo across the forests and plains attract other Herds who travel to the Waymarker. These Waymarkers, if large and powerful enough, will have their own guardians, called the Kkrassh in the Beast Tongue, though Humanity calls them Minotaur’s after the resemblance that the immense, horned creatures bear to the monster of legend. The Minotaur's are both immensely strong and almost twice the size of a normal Beast, their intelligence less then other Beasts and they become frenzied at the sight of anything that is not a Beast. Indeed a frenzied Beast is a terrifying prospect, a monster that can heft and throw small trees across clearings, or tear a man in two with it's bear hands. Once a group of herds have gathered, the Beastlord who called them there will explain why and what his plan is. Normally it will be some sort of raid or attack that requires more Beasts then his own herd consists of. The other Beastlords will then agree or disagree with the plan, until a concordance is reached. At this point, every Beastlord present will fight to determine who will lead the attack. This is a weapon less combat, though the horns, teeth, hooves and claws of the Beasts are more then enough to kill each other with. Indeed, it is rare for any Beastlord not to bear the scars of combat, the marks from the horns and teeth from other Beasts. Yet Beast herds are factitious and argumentative, their bestial natures preventing them from working together for any extended period of time. Indeed, it is probably this that has allowed the other Races to survive on the plains and within the forests for as long as they have. The Beasts are the most numerous Race alive, massively outnumbering even the expansive humans, yet scattered across an immense area. Should a powerful and forceful enough leader arise within the Beasts and unite the scattered tribes, then the results would be disastrous. The Elves would be swept away, the city of Lathrandar not built to withstand any sort of large siege, relying upon its isolation and the defence offered by the trees. Though the casualties inflicted upon the Beasts would be horrific, it would be nothing more then a drop in the ocean, a single tendril of an immense war host, numbering in the millions, a savage, screaming mass of fur and fangs, howling for the blood of the other Races. Krathar come! Krathar break human city! UNLEASH THE HUNT! Krathar Gorelord the Strong, before an abortive assault on an Order outpost in Lathrandar Forest. No trace was found of the outpost or it's inhabitants, other then the above words scrawled on a blackened wall. Hasskka, the Dark! Craaskkak, the Cruel! Nassak, the Fear! Gods of Beasts! Give Nizkkash strength! A Beast Shaman calling for unnatural superhuman strength. Though crude, the spell does appear to have worked.